Sunshine Global Premium Hemp CBD Oil is the therapeutic, highly researched 100% legal, fully insured Hemp CBD produced by top health companies dedicated to providing the strongest most effective pure blend extracted and delivered from harvest to extraction to application by the most tested methods and qualified professionals in the industry. It is a unique combination of all natural, organic phytochemicals blended with a specific formulation of terpenes that enhance the delivery system	and strengthen the potency and efficiency of Premium Hemp CBD Oil while regulating the passage of the terpenes and CBD into the cells. This regulatory activity acts as a buffer to control overactive cannabinoids such as THC, and an enhancer for the helpful terpenes while strengthening the potency of the Premium Hemp CBD Oil. Hemp, also known scientifically as Cannabis Sativa, has been found to have many of the terpenes found in various fruits and vegetables. In addition, when applying the essential oil extract of other plants to hemp extracts research has shown significant increase in therapeutic effects. Myrcene is a carrier and causes the active cannabinoids in cannabis, such as CBD, to bypass the blood brain barrier easier, thus allowing a significantly higher absorption of the cannabinoids. 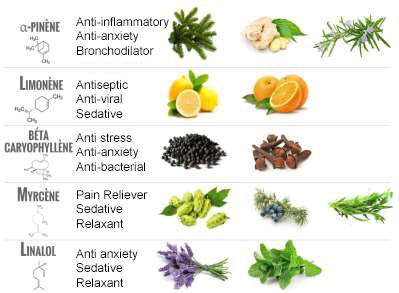 Below are some of the terpenes present in hemp and used in CAVINOL® and their distinct therapeutic potential. 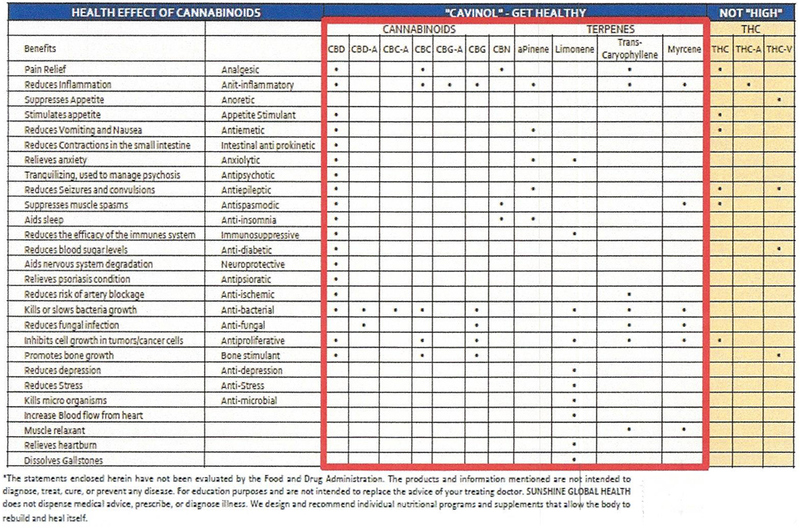 Here is a list of procedures tested in the field that we feel enhance the effectiveness and efficiency of the use of our Sunshine Global Premium Hemp CBD Oil with Cavinol®. For FIRST 3 to 4 DAYS - FRONTLOAD: Take 3 times a day for your FIRST 3 TO 4 FULL DAYS ON THE OIL. The suggested dosage is 2 drops regardless of the strength 2 times per day thereafter. You may increase to fit your needs. But MUST consistently stay on the SUGGESTED dose OF 2 DROPS until you use up the bottle. You need to do FRONTLOADING to (fill) your CBD Receptors in your Endocannabinoid system in your body. This is important! You may experience a short detox (use of bathroom) during the loading period. You MAY even experience an increase in your symptoms during the loading period. If this occurs, it is important that you MAINTAIN THE SAME DOSAGE - as this means your receptors are being filled and the CBD is working! PROPER NUTRITION: Try and drink only bottled or filtered water during your loading period. Eat healthy, nutritious foods, including a variety of fresh vegetables. Avoid overeating and space your meals to 4 to 5 light meals per day. Exercise. Try and walk or move at least a few minutes twice a day. APPLICATION TIPS: Every drop of Sunshine Global Premium Hemp Oil is precious. Because the oil is not diluted, it is thick, rich, and all natural and organic. Sometimes, the higher concentrates are difficult to flow from the bottle. The thick oil moves slowly particularly when the oil is refrigerated so it's best not to do this unless you know it will be going into heat above 90 degrees. We suggest you slightly warm the bottle of oil before using it (but not above 90 Degrees Fahrenheit). You can try rolling between both palms, or you may put hot water in a pot (again not over 90 degrees) and let whole bottle sit in for 5 minutes or so. This will make the oil flow smoothly. Also, we provide oil droppers to measure your dosage if necessary. Cannabinoid Receptors are located throughout the body. They are part of the Endocannabinoid system which is involved in a variety of physiological processes including appetite, pain sensation, mood and memory. We at Sunshine Global bid you good health. We ask that you please share your Hemp CBD Oil testimonials with others by writing or calling us. Helps to gently activate the endocannabinoid system. Some uses as a maintenance product. Full Strength Generally used for mild conditions. Extra Strength for chronic or acute problems. This is strong! Professional Strength A special blend of Hemp plant cannabinoids with CBD combined with select terpenes and Cavinol® Booster to offer the MOST POTENT AND EFFECTIVE Premium Hemp CBD Oil product available! In an all-natural, organic vegetable capsule. Post procedural maintenance - 25 mg CBD per capsule. The first successfully CBD-infused professional skin therapy creme. Helps treat psoriasis, dermatitis, sun damage, seborrhea, eczema, skin cancers, bruises, blemishes and generally bad skin. CBD is about getting HEALTHY not getting HIGH! What does Cannabidiol (CBD) do in that regard? Sunshine Global Hemp Oil and other cannabinoids exert their anti-cancer effects in a number of ways and in a variety of tissues which may make them applicable in all forms of cancer. *The statements enclosed herein have not been evaluated by the Food and Drug Administration. 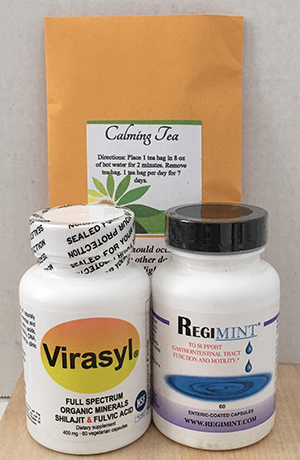 The products and information mentioned are not intended to diagnose, treat, cure, or prevent any disease. For education purposes and are not intended to replace the advice of your treating doctor. SUNSHINE GLOBAL HEALTH does not dispense medical advice, prescribe, or diagnose illness. We design and recommend individual nutritional programs and supplements that allow the body to rebuild and heal itself.